Los Ingenieros is a UCSB student organization founded in 1978. Los Ingenieros began when nine Latino engineering students formed a support group that shared common goals and aided each other in developing the skills needed in the professional workplace. Since then, Los Ingenieros has grown to an organization more than five times as big as the original nine members and has expanded to include all science, technology, mathematics, and engineering majors. The goal of Los Ingenieros is to serve its members, primarily in the Latin@ community, in the advancement of their math, science, and engineering education. Our organization is also dedicated to promoting these fields to students of all school levels ranging from elementary school to high school through outreach activities; our goal in doing this is to inspire the next generation of Latin@ STEM college graduates. One turning point in our organization’s history occurred in the mid to late 80’s when, under ambitious leadership, the organization moved towards a more professional and academically strong organization. This involved moving the meetings from El Centro, a largely Latin@ meeting place, to the rooms located on the campus’s College of Engineering, cementing LI’s presence in the University. In the early 1990’s the organization would become an official Society of Hispanic Professional Engineers student chapter, thereby increasing the organization’s connections with and ability to produce talented engineers and community leaders. 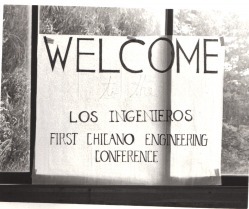 Los Ingenieros’ connections with UCSB consist of hosting numerous high school visitations, promoting events sponsored by the university and the College of Engineering, participating in the Engineering Student Council, partnering with the National Society of Black Engineers and working with El Congreso (Chican@/Latin@ Educational Opportunity Program). We also work very closely with the MESA Engineering Program and the MESA Schools Program to assist underrepresented students in their academic endeavors. Our largest collaboration event with MESA is our annual Science & Technology MESA Day with about 700 students from California, primarily from Ventura County and Santa Barbara County. In previous years the event received recognition from California legislators at that year's event. Overall, Los Ingenieros has hosted a significant number of successful activities and events that have garnered much recognition, including Student Organization of the Year for the following academic years 2010-11, 2008-2009, 2001-2002,1998-1999. LI has produced not only talented engineers and scientist, but leaders and event coordinators as well. Many of our alumni have gone on to have an impact beyond the engineering fields, some completing their law degrees and PhD programs, starting their own businesses, serving as political representatives, community advocates, and even becoming an astronaut, such as Jose Hernandez who was an LI member while pursuing his graduate degree at UCSB. Los Ingenieros, as an organization, has been as strong force for over 30+ years, and there is no end in sight. The LI family of talented engineers and scientist and STEM advocates extend throughout the country, and even internationally. This extended family supports each other’s endeavors, encourages new leadership and professionalism, and continues to have fun. We have learned that you can’t have a LIfe without LI.